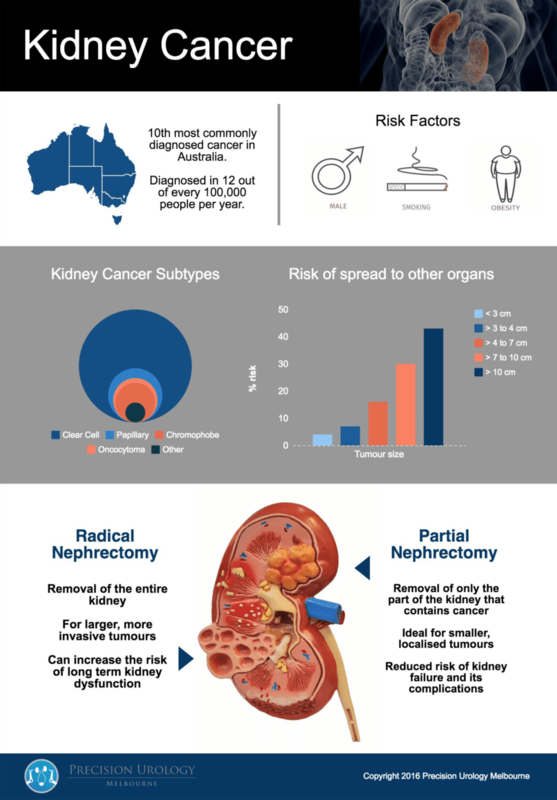 Kidney cancer is the 10th most commonly diagnosed cancer in Australia, affecting 12 in every 100 000 people each year. It affects men more commonly than women, and is most commonly diagnosed in people between the ages of sixty and seventy. We don’t know the exact cause of kidney cancer, but we do know that smoking, obesity and high blood pressure are risk factors. Additionally, a number of rare hereditary syndromes are associated with kidney cancer. Kidney cancers are classified according to their appearance under the microscope. There are many different types of kidney cancer, each with different sets of genetic mutations and differing degrees of aggressiveness. The three main types of kidney cancer, comprising 85% of cases, are called “clear cell,” “papillary” and “chromophobe.” Clear cell cancer is the most aggressive of these subtypes. Some tumours of the kidney are cancers that have spread from other sites, such as lymphoma, lung, breast or uterine cancer. In these situations the treatment options may be very limited. In the past, patients would be diagnosed with kidney cancer when they presented with symptoms of advanced disease, such as blood in the urine, a large mass in the abdomen or the presence of pain. Nowadays, it is more common for kidney cancer to be detected by chance, usually after an ultrasound or CT scan for other causes. When this happens the cancer is usually smaller and less likely to have spread beyond the kidney. One third of kidney cancer patients display “paraneoplastic syndromes,” which are collections of symptoms related to the tumour’s biological behaviour. These symptoms can include high blood pressure, high calcium in the blood, liver dysfunction, fever, weight loss, nerve problems and fatigue. CT scans are an important tool for assessing kidney cancer as they provide information about the size and local extension of the tumour, the function of the other kidney, and whether any other organs are involved. MRI is useful in patients who cannot have CT scans due to intravenous contrast allergies or pregnancy. A bone scan or brain MRI may also be required in patients with symptoms suggestive of cancer spread. What are benign tumours of the kidney? 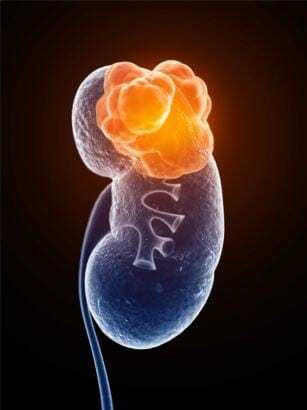 About one in four kidney tumours smaller than 4cm will be benign. A benign tumour is not cancer. It will not spread outside the kidney to other organs or shorten a person’s life. However, benign tumours can grow over time and cause symptoms such as pain or bleeding. Angiomyolipomas (AMLs) are benign tumours of the kidney that are composed of blood vessels, muscle fibres and fat. They are most commonly diagnosed in women aged 40-60, and as they grow larger they can spontaneously bleed, requiring emergency treatment. In most cases, tumours that appear to contain fat on CT scan and ultrasound can be confidently identified as AMLs without needing further tests. When small and asymptomatic they can be safely watched. Given the increased risk of bleeding during pregnancy, women of childbearing age should undergo treatment. Cysts are fluid-filled sacs within the kidney. They are very common and are almost always benign. However, if a kidney cyst has suspicious features on CT scan, such as thick internal walls or solid regions, then it should be considered cancerous and treated as such. Oncocytomas are benign tumors that cannot be distinguished from kidney cancer using imaging tests. The only way to confirm that a tumor is an oncocytoma is by examining it under a microscope, either after biopsy or surgical resection. What is the role of kidney biopsy? Kidney biopsy involves passing a needle through the skin to obtain a sample of tumour tissue that can be examined under a microscope. This can provide a diagnosis without actually removing the entire tumour or the entire kidney. It is usually performed under local anaesthesia and with CT or ultrasound guidance. Biopsy is appropriate for patients with small kidney tumours planned for observation, in patients planning to undergo non-surgical treatments such as radiofrequency ablation, and in cases where a kidney mass may represent cancer that has spread from another part of the body. Biopsy is not required in patients with malignant-appearing tumours for whom surgery is planned. Kidney biopsy provides the best results when performed by an experienced radiologist and the tissue examined by a pathologist with an interest in kidney cancer. What are the different treatment options for kidney cancer? Cancer that is confined to the kidney is best cured by surgery. Partial nephrectomy involves removal of only that part of the kidney that contains cancer. Sparing as much tissue as possible reduces the risk of future kidney failure, especially in patients with pre-existing conditions like diabetes that increase the risk of developing chronic kidney disease. Where technically feasible, partial nephrectomy is considered the standard of care for smaller, localised tumours and has the same cure rate as removing the entire kidney. Patients with kidney cancer in a single functioning kidney must undergo partial nephrectomy to avoid dialysis. Partial nephrectomy is also recommended in patients with pre-existing poor kidney function, or those with familial cancer syndromes who may require multiple operations during their lifetime. Radiofrequency and microwave ablation are reasonable alternatives for those who are not fit for surgery, such as elderly patients with multiple medical problems. When is it safe to watch a kidney tumour? Observation is appropriate in elderly patients with major coexisting medical conditions, where the tumour does not cause symptoms and has a low risk of aggressive behaviour. In these cases, the tumour can be monitored over time with periodic imaging, with a plan to intervene if aggressive features develop. Triggers for intervention would include a rapid increase in size, or if the tumour grows beyond 4cm. Observation is not recommended in younger patients, given the risk of progression to incurable disease during a patient’s lifetime. Also, as tumours grow, surgery becomes more complicated and kidney preservation may no longer be possible.